As far as I am aware there aren’t many of us, but the likelihood is that as time passes, the percentage of us will increase. Who are we? We often refer to ourselves collectively as ‘ostomates’, a friendly term to describe the one characteristic we all have in common – an ‘ostomy’. Some of us have an ileostomy, some a colostomy and some a urostomy; but whatever our ‘ostomy’ is, we all share something in common – we don’t go to the toilet the same way as everyone else does! In my case, I have an ileostomy, which means that I have had my colon removed and now I have to permanently wear a bag on my stomach to collect bodily waste (lovingly referred to as a ‘bag for life’). This is not a glamorous subject and certainly not one that I would be asked to speak about as an after dinner speaker. Generally, not many other than poo fascinated five year olds really want to talk to you about it. I don’t blame them. But this is who I am – through no fault of my own. It is the hand that life dealt me, so I have to work with it. In fact, many of the likely causes of a person having to have an ostomy are chronic illness or cancer and so it is certainly not self induced. When I say that there are not many of us, I refer to policing and more specifically, frontline police officers in the UK. It appears that there aren’t many of us as clearly it is not the type of thing most people talk about when introducing themselves. I have come across a few officers with an ostomy through my DPA duties, or those who are due to have one, but my estimate would be just a handful of people at most per force area. However, I sadly believe that as time passes I will come to learn of many more police officers joining the ranks of the ‘police ostomates’, merely due to the increased prevalence of medical conditions such as bowel cancer, Colitis and Crohn’s disease. However, being a frontline police officer and having an ostomy is by no means a deal breaker for your policing career, although some ill informed would lead you to believe that it is. There is usually no reason why you cannot perform frontline duties. In fact having an ostomy rarely puts any aspect of your life on hold – provided that you take the right steps to ensure your safety, comfort and confidence. 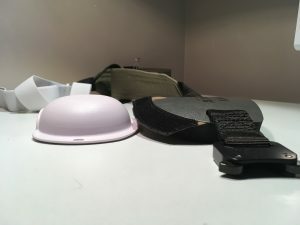 Having a small piece of your ‘insides’ poking through your skin to the outside, is always going to make you a little more vulnerable than others, but we are not in the dark ages anymore – there are a plethora of products out there to protect your stoma, give you confidence and reduce the risk of abdominal hernias. You just need to know where to find them, how to access them and which ones are right for your needs. I have had the fortune (or misfortune depending on which way you look at it) of not consistently being in a frontline role since my operation to remove my colon in 2013. However, I have performed ad hoc frontline duties since then which have required me to wear some additional form of personal protective equipment (PPE to you officers who like a good acronym). I suspect that following my operation, when I was signed fit for duties by the force FMA, there weren’t any other officers in my force who were in the same position as me with an ostomy. I think this because other than being told I could return to frontline duties and me stating that I had been given an ostomy guard from my stoma nurse, I wasn’t offered any other advice or guidance and wasn’t required to show them the so called ‘stoma guard’. I am not suggesting they weren’t doing their job properly, just that I suspect they hadn’t previously had to consider the issues of having a frontline officer with an ostomy. This wasn’t a problem for me as I am very independent and so self management comes easily to me. This part of the story is important, as I don’t want other colleagues to make the same mistake as I. It was only last week (nearly 4 years on) that I mistakenly learned that I actually should have sought authorisation from our Officer safety department to use any additional protective equipment – even if it is for medical purposes. In my mind at the time I considered an ostomy guard to be ‘medical equipment’ so didn’t think to consult the Officer safety department. However, after having met with them, there is now a question as to who else should approve the use of such equipment. The Health and safety department? Occupational health? It would appear that in my force I am trekking through unchartered territory. It is therefore no wonder that I have had officers over recent months coming to me for advice – something I am more than happy to provide. It is important to acknowledge here that the requirement of such equipment would be classified as a ‘workplace adjustment’, and provided it is ‘reasonable’ to do so (based on factors such as cost and effectiveness), your force should provide this for you as a reasonable adjustment under Equality Act legislation. Therefore, although you may want to select the equipment yourself to suit your needs, this should be done in conjunction with your force to ensure this is provided without any personal expense to you. When I first returned to frontline duties my stoma nurse very kindly ordered me an ‘ostomy’ guard to wear over my ileostomy whenever there might be a risk of injury or blunt force trauma. As with most ostomy medical products this was provided to me free of charge as part of the medical exemption scheme on prescription costs. As well as a guard I was also given a ‘hernia belt’ to reduce the risk of hernias. It is not just for policing purposes that these products should be used, it also includes physical exercise, lifting, gardening, playing with your 5 year old who accidentally knocks you in the stomach every 5 minutes and….well you get the gist. 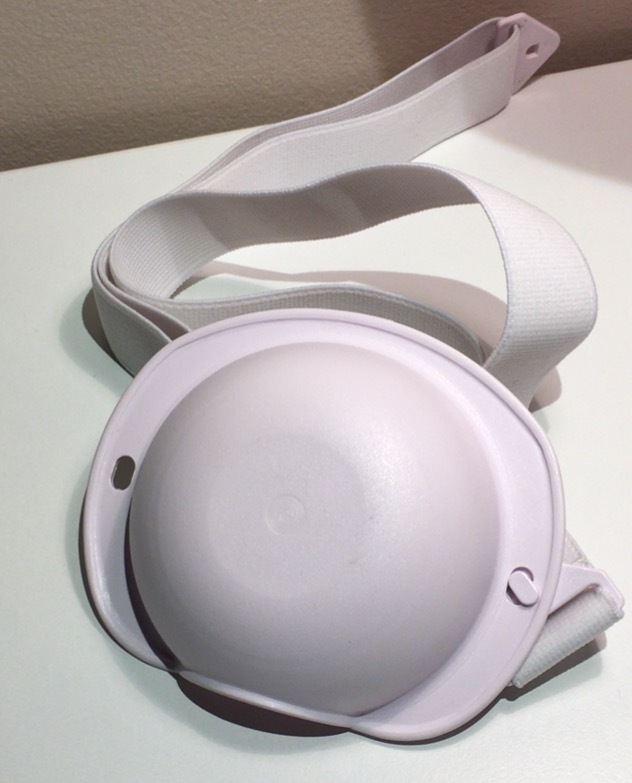 The guard I received was a dome shaped, strengthened plastic ‘cup’ (see photo below). Similar to a box that men might wear when playing sports like Cricket, only smaller and round. The cup was hollowed out inside with an opening on one side of the cup to allow waste to drain away into my bag. The cup is held in place by an elasticated band that fits around the waist. The guard was as simple as this. I even read somewhere that during product testing a car was driven over one to test its strength! Presumably it survived the test drive. The guard would certainly be effective in reducing injury that could be caused by a blow to the stomach area. Luckily, I haven’t had to test this whilst I have been wearing it, but I don’t doubt it would do the job. However, the guard appears to be an inexpensive product to produce, seemingly made of only one material (other than the waistband) – plastic. The problem here therefore is comfort. I have worn it for an entire 8 hour shift and it was not in the least bit comfortable. The elasticated band dug into my skin, the guard didn’t seem to stay in place and if I was struck in the area of the guard, I can only presume that the lack of padding would make this a more uncomfortable experience than it need be. I also question whether this would actually cause more injury to the area surrounding my stoma than if I wasn’t wearing it all. I haven’t tested it in this way, so couldn’t say for sure. The hernia belt is an elasticated waistband, designed to hold your stomach muscles in to reduce the risk of developing a hernia. I was given a couple of types of band, one more comfortable than the other, however, when worn over the top of the guard and underneath a shirt and body armour, they can get very hot and uncomfortable indeed. Especially as the band is quite thick, approximately covering a third of my torso area. I have also found that over time with repeated washes (which are necessary daily due to how hot the product makes you), the elastic in the band has started to fray and lose elasticity. The products are clearly cost effective to produce, but lack considerably in design for the purposes of comfort. I also wouldn’t recommend these products to people who lack confidence in their appearance or who are self conscious about their stoma. The cup can be quite obvious when worn just under a single layer of clothing. A dome shaped bulge is visible. All in all, the few times I have worn these products, whilst clearly fulfilling their purpose adequately, I personally do not find them comfortable enough to wear for long periods of time without wanting to take them off. I really don’t find them comfortable to wear as a frontline police officer and that is based only on the handful of occasions that I have actually worn them. I wanted to find a more comfortable product for use on a day to day basis, so I started doing some searches using a popular web browser. All I could find in terms of products manufactured in the UK were simply just other plastic looking guards of slightly different design. I really wanted to find an all in one product, but couldn’t. Everything I found looked very ‘clinical’ rather than ‘everyday functional’. 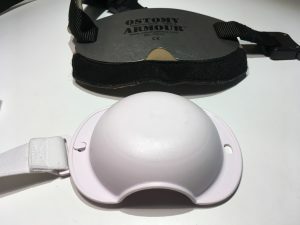 I then came across some products from the USA, several in fact, which instantly seemed from the pictures to have been designed more as a functional rather than clinical product, which had not only comfort but also style in mind. Not only was I interested in a product for myself, I also now wanted to solve a bigger problem – how can I help my colleagues across the Country who also need a better product? My first step was to start asking for sample products to review, so I could find a good product advise others of, especially colleagues who had been told by their FMA that they can’t do frontline duties……..ever again. My aim was to give my colleagues some hope and to educate FMAs using my own personal experiences. I was bold in my ask but honest in my intentions. I simply emailed companies asking if they would be prepared to send sample products for this very purpose. Surprisingly, even to this day, only one of the ten or so companies I emailed actually replied. Not only did they reply – they replied in 24 hours and within weeks a box full of products to test had done the journey across the Atlantic to arrive at my local sorting office. The company who replied was Ostomy Armour, run by a lovely US-UK husband and wife duo who have provided fantastic customer service. They are not a large pharmaceutical company, merely two people with some personal experience who designed their own product to fulfil a need. I like the fact that they are not a large pharmaceutical or medical supplies company, because I think it is really important to support smaller businesses, here in the UK and across the world. 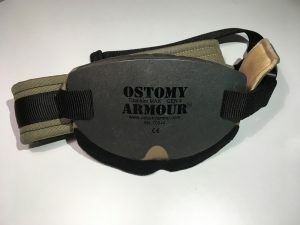 I was sent several different items by Ostomy Armour, but for the purposes of this review, I will just be covering the main product – the Ostomy Armour Titanium Max. It has a name like an Arnold Schwarzenegger film, a front cover like Robocop’s chest plate and a belt buckle named after a deadly snake, so first impressions were that this guard would certainly appeal to police officers who like their clothing and equipment named after rough, rugged, top of the food chain type of things. Thankfully, the product lives up to it’s first impressions. I have field tested it whilst gardening, playing rough with the kids and even at Jump Street (an indoor trampoline centre). It has passed the test on every single occasion and I often forget that I am even wearing it. Earlier in the article I described how my current product is not overly discreet when worn underneath tighter fitting clothing due to its shape and size, creating a ‘bulge’ under my shirt. The Titanium Max however, has been designed to be more discreet, with the guard element of the product being flatter and larger in surface area, meaning it is less visible underneath clothing. This instantly provides me greater confidence when compared to my previous product, as I am less conscious about how it looks to others. The Titanium Max looks more like something you would ‘wear’ as opposed to something you have to ‘use’. If this doesn’t make sense to you, then I refer you back to my description of my previous guard looking ‘clinical’. The Titanium Max actually looks like a piece of personal protective clothing. 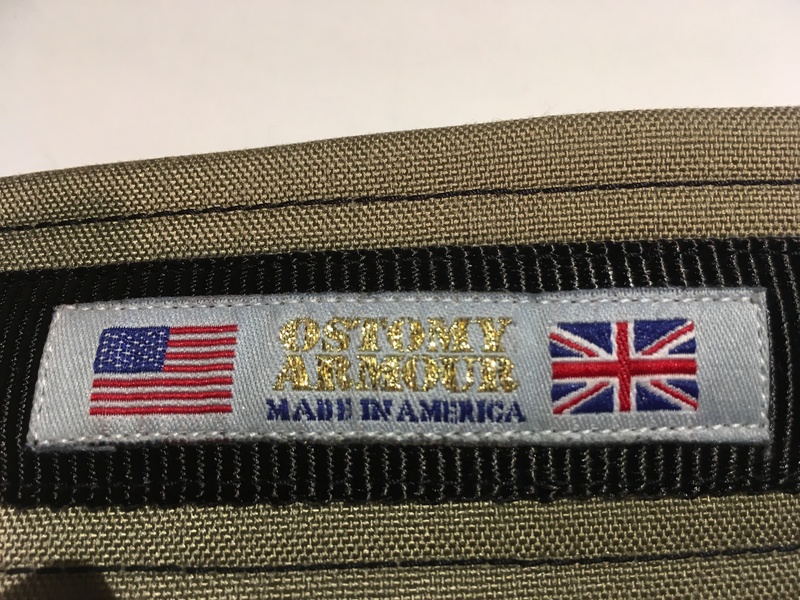 Most other things that could be said about the aesthetics of such a product are a little irrelevant as in most if not all cases, the product will be worn underneath some element of clothing, so won’t generally be seen. The Titanium Max is designed as an “all in one” product, offering protection to the stoma as well as protection against developing hernias. I personally like the fact that I only have to wear one item rather than two. The protective element of the guard is made of a thin, but hardy layer of titanium. There is sufficient flex in the material to allow it to bend slightly during use without compromising the products integrity. This provides more comfort over the rigidness of the plastic guard which can make it uncomfortable at times. 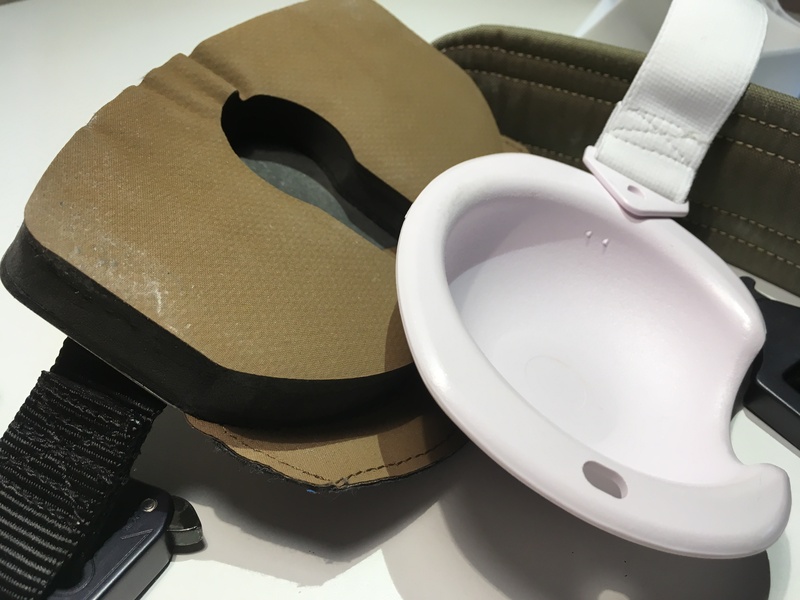 The reverse side of the Titanium Max is covered in padding, except for the hollowed out area that fits over the stoma and the channel that allows waste to drain away. The padded material is comfortable against the skin and provides sufficient absorption of energy if there was an impact on the front side of the armour. 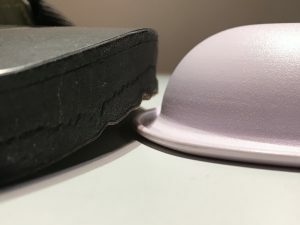 This padding would certainly reduce the likelihood of further injury being caused in the event of a blow to the armour, unlike the plastic guard which has no means of absorbing any impact. The Titanium Max is also spread over a larger surface area on the body than the plastic cup, again providing more ‘absorption’ of energy in the event of impact to the guard, dissipating the force of a blow to the guard. The material layered on top of the padding, which makes contact with the skin when the armour is worn, is made of a non-slip material, reducing the risk of the armour moving out of place if the surface of the skin becomes moist. 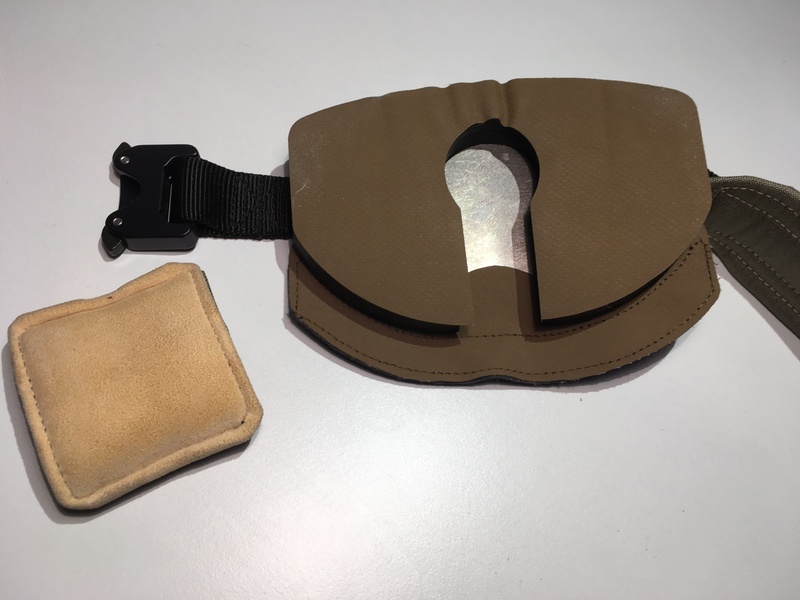 The belt of the Titanium Max is not elasticated unlike the plastic cup guard, which enables the product to provide hernia support as well as the protective guard function. 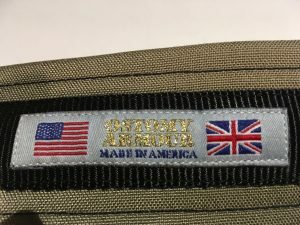 The belt is pulled tight by adjusting the strap and is made of US army grade ‘webbing’ making it comfortable and durable. When wearing it I have found that the belt doesn’t dig into my skin like the elasticated belts. 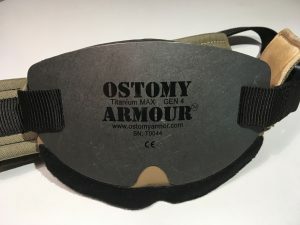 The Titanium Max has clearly been designed by someone who actually wears the product and understands what it is like to wear one for long periods of time, because there are plenty of little features which show how well the product has been designed. For instance, there is a small square of padded material which slips over the metal cobra belt buckle to ensure it does not become uncomfortable during use. I have had to add a little feature of my own to this, as the padded square occasionally moves out of place during use, so I have added a small piece of Velcro to secure it to the belt buckle during use – but this is a relatively minor point. Another of the features I really like about the Titanium Max, is the way that the bottom of the guard lifts slightly away from the skin, making it easier for the waste to drain away into the bag underneath. This has simply been achieved by attaching the belt just slightly off centre toward the top of the guard. I would usually find with the plastic cup guard that waste would sit in my bag within the confines of the cup without draining away to the bottom of the bag, but this doesn’t happen with the Titanium Max. You will also notice that along the bottom of the guard is a strip of Velcro (the softer side of the velcro) to allow for another clever feature to be attached – a Kevlar cover to protect the rest of your bag from being punctured by sharp points. I personally think that if you were going to get stabbed, then whether or not the contents of my bag was emptied at the same time is not really of concern, but this attachment does offer additional stab/slash proof protection whilst on duty – so that can only be a good thing for personal safety. My Kevlar cover is a little on the big side however, so when ordering your products, take care in assessing how long/big the Kevlar cover is that you are ordering. For the purposes of this review I don’t believe the cost of any Ostomy guard products to the end user is important. Firstly because some products will be available to you on the NHS as part of your free prescriptions. Those products that are not available this way, should be paid for by your police force as a reasonable adjustment, to enable you to continue to your job, as mentioned earlier. The costs of most products in this respect are ‘reasonable’ and so the employer would have a duty to make an adjustment and purchase the required equipment. If you encounter any difficulties in seeking products such as the Titanium Max as a reasonable adjustment funded by your force, please do get in contact with us or your local force disability support network, so that you can be assisted in exploring this with your employer. In conclusion, I think that Ostomy Armour’s Titanium Max is an excellent piece of protective equipment for any stoma (product reviewed is for ileostomy however, products are also available for other types of Ostomy). The customer service from the company is personal and friendly, the product is hardy, and it is packed full of features for comfort and functionality. The Titanium Max is certainly the best product I have encountered so far that meets the needs of police officers and other emergency service workers who require a greater degree of protection, comfort and confidence, but equally I would recommend it for general day to day use. This article has been written as a product review based on the thoughts, opinions and experiences of the author. This article does not necessarily reflect the views of the Disabled Police Association and has been written as an informative article. Other products are available.